I’ve always tried to use and recommend using the ‘least privileges’ model when designing and implementing systems. But we’ve all been there, when the same service account is being used to connect everything to vCenter, and said account has been assigned the full administrator role and propagated within vCenter. I’m getting my lab set up again and I needed to install VMware Update Manager (VUM). I realised that in the lab previously I have just done as I mentioned before and used a high privilege service account thinking “it’s just a lab”. I thought this would be a good chance to check what privileges are actually required to install and register VUM with vCenter Server. I’ve quickly documented the steps below including the only privilege that is required. After the role is configured with the required privilege, the role needs to be associated with a user or group and an item in the inventory to create the permission. The service account now has the correct privilege within vCenter, and it doesn’t have any more privileges than it requires! If you ever plan to uninstall VUM, you may need to come back into the role and add the privilege Extention > Unregister Extension, so the uninstaller can correctly unregister itself from vCenter. 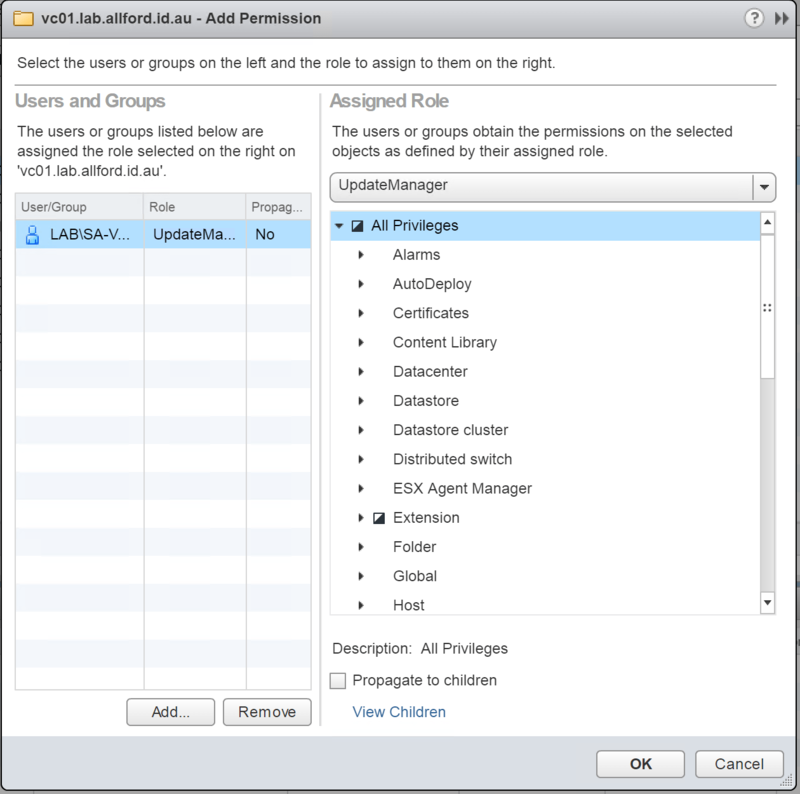 After VUM has been installed, there will be a new set of privileges available under ‘VMware vSphere Update Manager’, and these control the privileges within VUM itself. I’d suggest creating a group such as ‘VUM Users’ or ‘VUM Admins’ and adding users into this group that require VUM access. VMware Update Manager-build-3545890: 09/20/16 20:28:37 Found "C:\Program Files (x86)\VMware\Infrastructure\Update Manager\vciInstallUtils.exe"
Both of these point to invalid privileges for the account you specified in the VUM installer.